What? Do you have a more hilarious and awesome example of social construction? (I mean, other than tuna in jello?) I want to see it. "Night before feeling on the morning after." That does not sound pleasant at all! Tempting! 6 proof is only 3% alcohol though, about the same as weak beer. So you wouldn't get drunk on just a toothbrush-full. Chicken; egg. Is this advertisement social construction, or a market _response_ to an _existing_ construct? I can't help but think this would sell well if marketed today. Well, considering the sterilizing effects of alcohol, this would probably work. 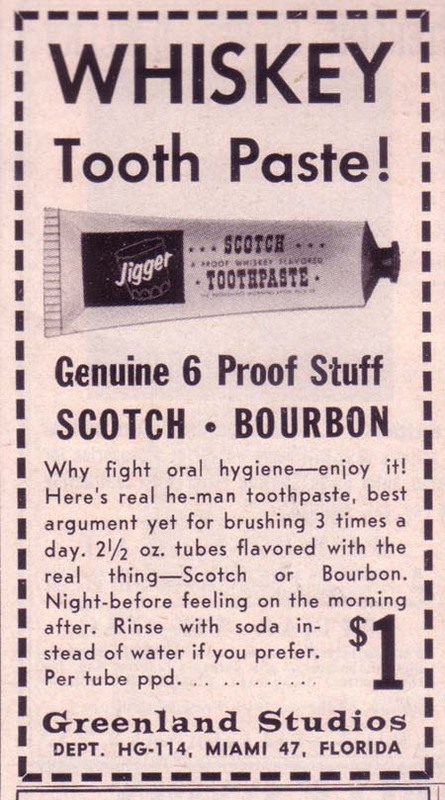 It's why they put booze in mouthwash, after all. I guess he was telling the truth after all. For Real! My grandfather had this on his bathroom sink!!! I can only tell you that that stuff really stunk of Booze. I never tried it myself!! whiskey tooth paste take my mind! But what if I only use it on the mornings that I feel like P. Diddy?! this used to be sold thru the johnson smith company. don't think they are still around.